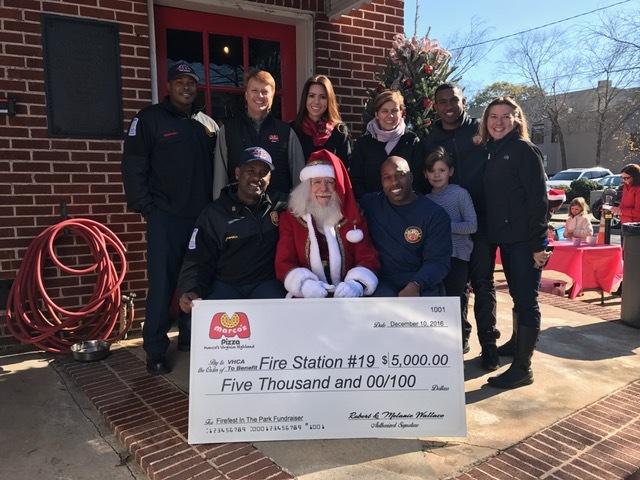 There’s a strong tradition of giving in Virginia-Highland during the month of December – especially when it come to the Fire Station 19 restoration project. This year’s breakfast at Osteria 832 raised $5,000 for the fire station, making it the number one beneficiary of Rich Chey’s restaurants’ giving. This brings their 14-year total amount of funds raised for the station to $55,000! 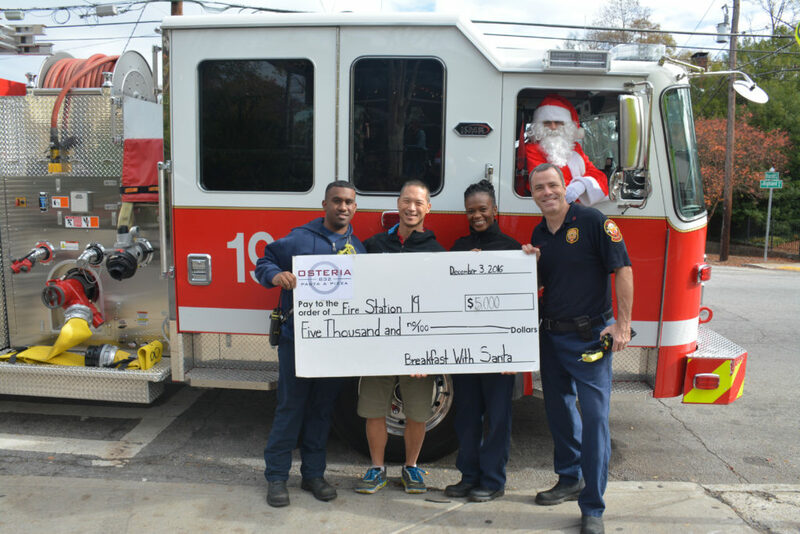 Doc Chey’s owner Rich Chey presents the Fire Station 19 crew with the proceeds check from Breakfast with Santa. Photo credit Ashley Lepore. Marco’s Pizza sponsored FireFest in October and raised $5,000 for Station 19. Thanks to Marcos owners, Robb and Melanie Wallace (pictured above on the back row second and third from the left) who brought their larger-than-life donation over during Santathon. The firefighters pictured are F.F. Kinan Humphrey (back row, left), F.F. Chris Knott (back row, 2nd from right), Cpt. Quentin Campbell (front row, left), and Sgt. Germaine Stringer (front row, right). 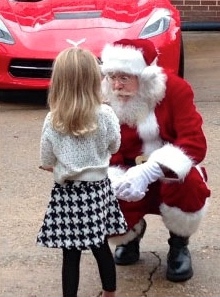 We also just wrapped up our 3rd annual and most successful Santathon, presented by Tailfin Marketing. 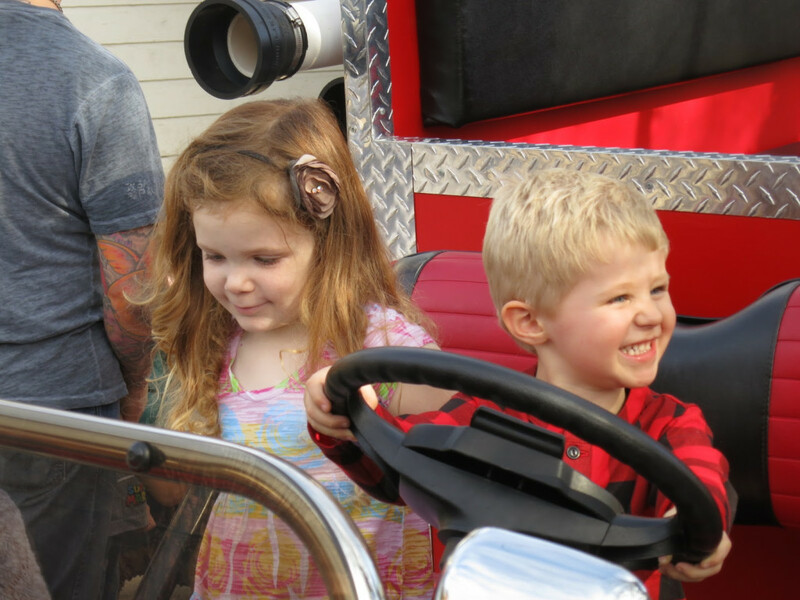 This year’s fundraising event raised an additional $4,000 for Fire Station 19. These funds will be added to those already collected for the restoration project, and there will be additional events in 2017, such as the Morningside Mile on March 16. However, there is still a need for more money – about $15,000 more is needed. Did you know that you can make a tax-deductible donation to VHCA’s Virginia-Highland Conservation League (VHCL)? Your money will go directly to neighborhood projects such as the Fire Station 19 project, local park improvements, and payments on the loan for our very own North Highland Park. You can mail a check (made out to the Virginia-Highland Conservation League) to VHCA at P.O. Box 8401 Station F, Atlanta, GA 31106. You can also make an online donation by clicking on the Donate button on the main page at vahi.org. A letter confirming your donation can be mailed to you if you would like to receive one. Reach out to vhcl@vahi.org if you have any questions. Virginia-Highland’s holiday tradition returns to historic Fire Station 19 on December 10th from 11;00 a.m. – 2:00 p.m. Kids and parents are invited to join us for arts and crafts activities and have their photos made with Santa himself. All proceeds go to Station 19 renovations. Our sponsors this year include Tailfin and many others who are adding to the fun with activities, treats and specials including Google Fiber, Virginia-Highland Civic Association, San Francisco Coffee, Avant Gardener, Barefoot Mountain Farms and Knock Music House. Click here to reserve your spot and remember that walk-ups are also welcome! 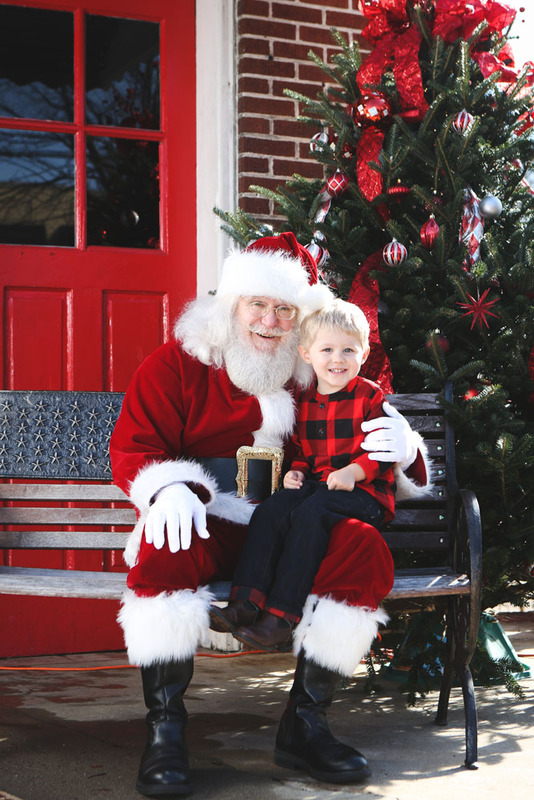 Don’t Miss Photos With Santa at Fire Station #19! Station #19 Firemen. 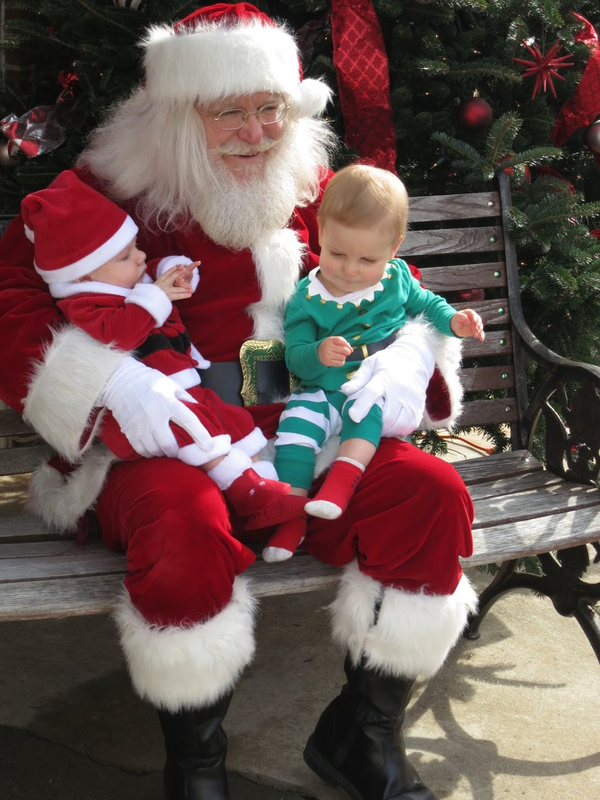 Photos with Santa. Fire trucks. Crafts. Hot chocolate. What are we missing? … You. Please come join us on December 10th from 11:00 a.m. – 2:00 p.m. as we have fun and raise funds for Fire Station #19 renovations. You can sign up for pictures or walk up – we’ll do our best to work everyone in. Don’t miss the chance to decorate ornaments and have fun with your neighbors. Steve Spetz will be on hand again this year doing great caricatures. And if you just want to hang out and volunteer for the event, you can do that through the link above. Along with the Fire Station’s great hats, t-shirts, and mugs, we’ll have prints of Steve Spetz Fire Station watercolors for sale. Our sponsors so far this year include Tailfin and many others who are adding to the fun with activities, treats and specials including Virginia-Highland Civic Association, San Francisco Coffee, Avant Gardener and Barefoot Mountain Farms. 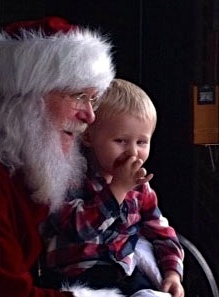 By all accounts, the Fire Station #19 Santathon fundraiser was a huge success. If the children’s smiling faces didn’t make it clear, the great turnout in spite of rain and the firemen’s appreciation sure did. We can’t thank the firefighters enough for opening up their “home” to the neighborhood and for all they do for our community. And thanks to the community for coming out to have fun and show support. We raised nearly $3,000, not a small amount for a first-year event. We’re hoping to continue to raise additional funds for the much-needed repairs and improvements that will preserve this historic fire station. You can browse through shots of the events and donate to the fund at www.station19santathon.com. Your donations are tax deductible. A special thanks goes out to Catherine Lewis for her amazing coordination skills and dedication, our Fire Station #19 firemen, Santa, Councilman Alex Wan for supporting our neighborhood and fire station, Rich Chey for helping raise funds for Fire Station #19 as well and supporting Santathon and the Virginia-Highland Civic Association. Of course, none of this would have been possible without the incredible volunteers who donated countless hours. Thanks to our generous sponsors again for their support and donations: Osteria 832, George’s, Photography by Alli, Virginia-Highland Civic Association, Virginia-Highland Tour of Homes, Avant Gardener, Fit: To Be, Kroger, San Francisco Coffee and Barefoot Mountain Farms. Here at Tailfin Marketing we are already looking forward to next year’s event. Can’t wait to see you all there! Fire Station #19 Santathon is On! 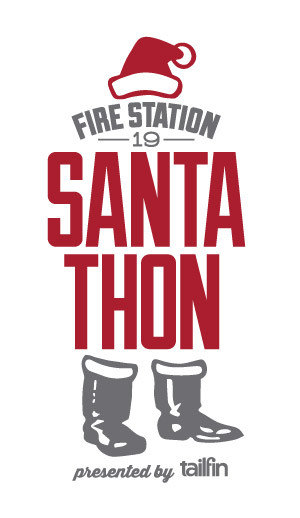 From caroling to roasting s’mores to selfies with Santa, there will be something for everyone to enjoy at this Santathon to benefit Fire Station #19. 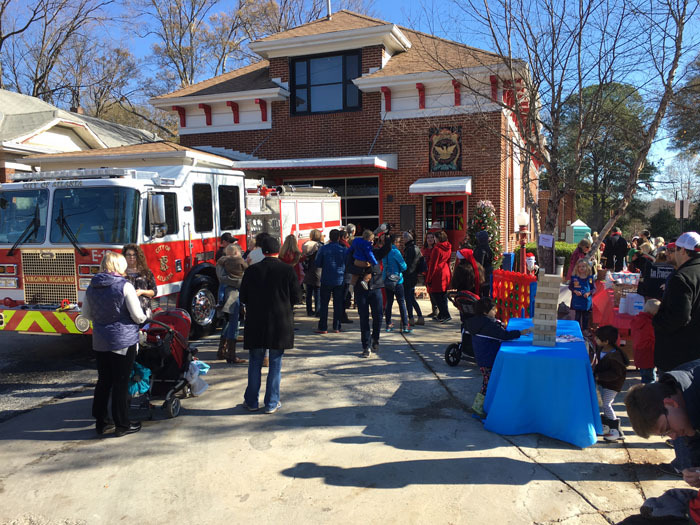 In the spirit of holiday giving, this festive event – presented by Tailfin Marketing – is a fundraiser with proceeds going to help restore our historic fire station. Fire Station #19 is Atlanta’s oldest continuously operating fire station, was designed by Atlanta’s City Engineer, C.E. Kaufman, and built in 1925. The station sits in the heart of Virginia-Highland and holds an important place in the hearts of VaHi residents. It is home to a 1925 American LaFrance fire engine, much like the engine that would have operated out of the fire station in its early days. The firefighters have been raising funds for several years and have plans in hand to make repairs and improvements that will preserve this fire station for years to come. Please take part and help preserve our important landmark Fire Station #19! 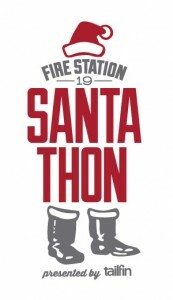 Starting Nov. 28th visit http://www.station19santathon.com to sign up for Santathon events by appointment. Residents and visitors are also invited to drop by and participate throughout the event.